Dodge is right on target with the '75 Dart Special Edition. It's a lot of luxury in a little car. If you've found that a lot of small cars today are pretty small on comfort and style, then the '75 Dart Special Edition is the small car for you. It has an array of standard features that are usually anything but standard. Seats covered with crushed velour upholstery. Plush carpeting on the floor, halfway up the door, and even in the trunk. Map pockets are standard. So are color-keyed wheel covers. And front disc brakes. And power steering. Even the radio is standard. 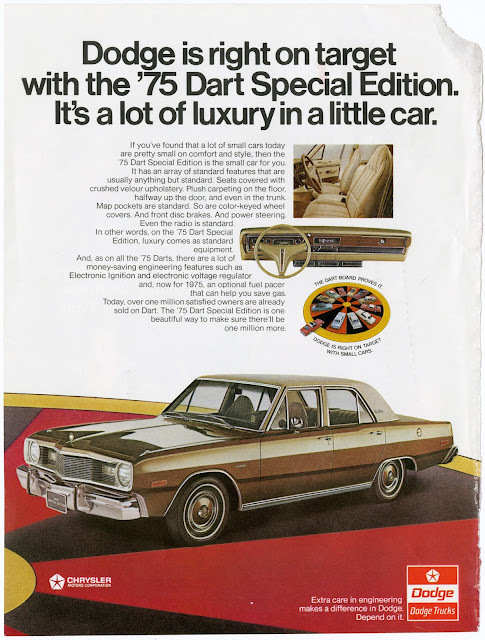 In other words, on the '75 Dart Special Edition, luxury comes as standard equipment. And, as on all the '75 Darts, there are a lot of money-saving engineering features such as Electronic Ignition and electronic voltage regulator and, now for 1975, an optional fuel pacer that can help you save gas. Today, over one million satisfied owners are already sold on Dart. The '75 Dart Special Edition is one beautiful way to make sure there'll be one million more. The Dart board proves it. Dodge is right on target with small cars. Extra care in engineering makes a difference in Dodge. Depend on it.